So Bella is 5 months old! I'd say this has been the most challenging month so far besides her first month. I dealt with a medical issue that turned Bella's and I nursing routine upside down. Oyvay! Check it out! Nursing/Maternity Clothing Review - Asos - Frumpy or Fashionable? I don't know about anyone else but I am struggling to find cute clothes for my post partum body and ones that are breastfeeding friendly. 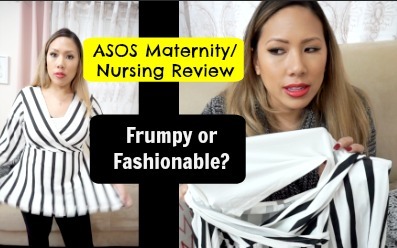 I thought it'd be interesting to do a review and try on of some items from the Asos Nursing/Maternity line since we all love this brand. Check out to see whether the clothes ended up being fashionable or frumpy!